Purple Socks, Pt. 3: One Sock Done! Yup! I finally completed one sock in the Purple Sock pair, over month after I started them. The reason why it took so long? I burned myself out on them, quite simply. For about three weeks that incomplete sock had been starting at me on my project pile. Taunting me. Provoking me. Finally, I gave in to it and starting working on it again. Actually, I want to start another ambitious project, but I have too many outstanding ones at this time, so I need to complete what I have working before I start another one. The socks are a part of that “needs to be done” pile. So, that’s where I am with the socks, or sock, for that matter. I did cast on the second one, too! I have a few rounds of the ribbing cuff done. Yay! I’m a little over halfway done! Since my last post about these socks, the first sock has come along quite a bit! I’m currently working on knitting the gusset of the sock. I have to admit, I find knitting the gusset the most tedious part of sock knitting. It’s just me. I just want to get on to the foot and toe and be done with it. Still, I am having a nice time knitting this sock, and I’m almost done with the gusset, anyway. And following the pattern on the second needle is simpler than it looked at first. The pattern has mostly been a nice, relaxing pattern. I have a few more notes about my latest update on the Ravelry page for my purple socks. In other crafty news, I ran out of yarn on the scarf project I work on at work during breaks, but I did have a tatting shuttle and thread in my bag, so I decided to tat a little bit. I don’t know much about tatting, but I did figure out how to tat a chain. I guess you can learn a lot of your lunch break! I cast on my socks last night! Yay! I had forgotten how much it takes to knit with tiny yarn on tiny needles. I’m telling myself that I should enjoy the process of knitting socks, but still look forward to the outcome, which isn’t probably going to be for about a month or so. If you care to see the details and follow the progress of my socks, you may do so on Ravelry. The photo above doesn’t do it justice, but I love the stitch definition in the Stroll yarn I’m using from KnitPicks. It’s really quite nice. It feels good to knit something other than scarves now, too. I do love knitting them for charity, but it’s nice to take a break from them and knit something for myself. And these socks are definitely for me! So, my sock itch is on its way to being scratched. Socks are of those those knit items that I get the itch to knit every now and again. And I have to scratch that itch by knitting a pair. I have that itch now, and I’m getting ready to cast on a pair. First, I need yarn, I chose this yarn from KnitPicks. 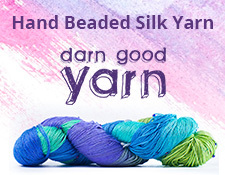 I generally like their products, and since this yarn is washable, I’m all for it. The color is called Sprinkle Heather, which a blue/violet. Next, I need a pattern. I love the look of cables on socks, but I am not a fan of constantly struggling with a cable needle on a project this delicate. So, I found the Faux Cable Socks pattern by Jen Lucas on Ravelry. It looks like my sort of pattern, and that solid color of yarn I chose should be lovely. As soon as that yarn gets here, I’ll print out the pattern and start knitting. Hopefully, I won’t get “second sock syndrome” and have a nice new pair of socks to show off in a month or so.